The University of Mississippi, along with many universities across the country, continues on a journey to acknowledge and address the challenging and complex history around the issues of slavery, injustice, and race. The university has long been committed to honest and open dialogue about its history and how to make our campuses more welcoming and inclusive. Guided by recommendations from the 2013 expanded Sensitivity and Respect Committee, the university put forward the 2014 Action Plan. Upon arrival at Ole Miss in January 2016, Chancellor Jeffrey Vitter committed to the 2014 Action Plan and much has been accomplished. In summer 2015, Interim Chancellor Dr. Morris Stocks appointed a committee to address recommendation 5 from the 2014 Action Plan, which urged the university to “offer more history, putting the past into context” and to do so “without attempts to erase history, even some difficult history.” The committee, composed of Drs. Donald Cole, Andrew Mullins, Charles Ross, and David Sansing, was charged to draft the language for a contextualization plaque for the Confederate statue at Lyceum Circle and three other sites. The committee completed its work on the Confederate statue in fall 2015, and the plaque was ordered for fabrication. The plaque was installed in front of the statue upon arrival in mid-March 2016. Once the plaque was installed, the committee and Chancellor Jeffrey S. Vitter received a great deal of input from the community. Three important messages emerged from that feedback: (a) lack of awareness of the committee and its work, (b) insufficient opportunities for community input, and (c) suggestions to change the wording on the plaque. This historic statue is a reminder of the university’s divisive past. Today, the University of Mississippi draws from that past a continuing commitment to open its hallowed halls to all who seek truth, knowledge, and wisdom. As a result of the questions that arose during the initial work on the Confederate statue and given his firm belief in the importance of input, transparency, and comprehensiveness, Chancellor Vitter wrote a letter to the community on March 29, 2016 to announce the coming formation of the Chancellor’s Advisory Committee on History and Context (CACHC), which would be charged with identifying and contextualizing all relevant sites on campus so as to address recommendation 5 of the 2014 Action Plan. Once the recommendations have been reviewed by the Chancellor’s office and the list of sites is finalized, the committee will proceed with designing content and format to contextualize the designated sites. The committee engaged in a transparent and inclusive process aligned with the UM Creed and employed a variety of methods to ensure broad community input. For phase 1, the CACHC examined all other sites for potential contextualization and issued recommendations, and Chancellor Vitter then charged the CACHC to do the actual contextualizations in phase 2. In his July 6, 2017 letter to the community, Chancellor Vitter announced the final report of the CACHC and the resulting university actions, which included several contextualization plaques and two additional projects put forward in Section B. 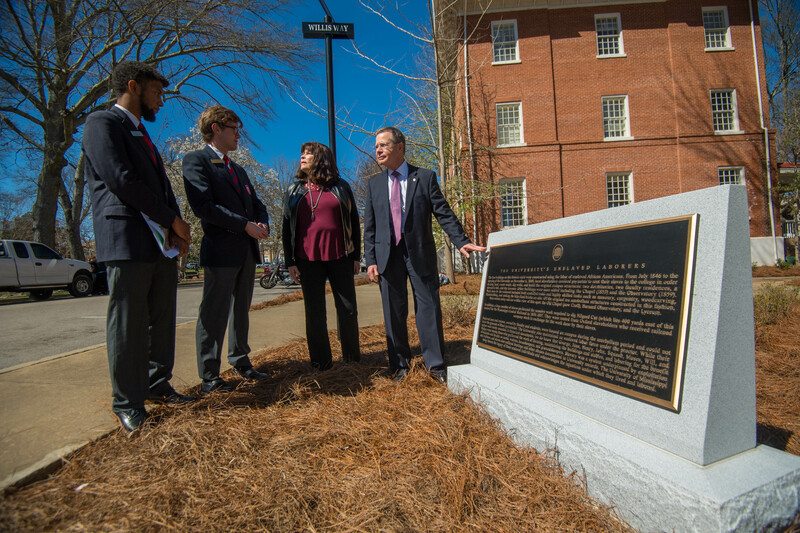 Six contextualization plaques were installed on campus, and an unveiling ceremony took place on March 2, 2018. Officials unveiled contextualization plaques for Barnard Observatory, Lamar Hall, Longstreet Hall, and George Hall; a plaque recognizing the university’s enslaved laborers in the construction of Barnard Observatory, the Old Chapel (now Croft), the Lyceum, and Hilgard Cut; and a plaque contextualizing the stained-glass Tiffany windows in Ventress Hall that recognizes the University Greys, a Civil War company of primarily UM students that suffered 100 percent casualties — killed, wounded or captured. Video and speeches from the March 2, 2018 event and images of the plaques are available at context.OleMiss.edu/Implementation.